Mexico’s Day of the dead is one of the biggest holidays of the year, beginning on October 31 ending on November 2. Altars are set up in homes for loved ones in the other world, in expectation of their return visits. First the spirits of innocent children come on All Saints Day. Miniature cups, saucers, and their favorite toys, are placed on the altar for them to enjoy. The next day —All Souls — the adults return. Altars for adults also have their favorite foods, clothing, and things they enjoyed when they were alive. Marigolds, candles and incense are on and all around these alters to guide the spirits home again. A special bread with a plastic skull inside, known as pan de muertos, is also present. The person who is lucky enough to bite into the skull will have good luck. Topped with sugar in the shape of bone, the bread is delicious. Skulls are everywhere. Some of them are made out of sugar and decorated with frosting. On the night of the 2nd, families gather at the graves of their loved ones for all night vigils. They have adorned the graves with beautiful, elaborate and expensive artificial flower arrangements, using lots of ribbons and bright colors. They play music, have picnics , talk to their loved ones who have crossed over and enjoy the companionship of other families nearby. Some believe that if the dead aren’t honored enough on that day, they get revenge on the family the rest of the year by creating bad luck. But mostly it is a celebration of love, not of fear. North Americans are going more in this direction in their thinking about loved ones who have died. In the past few years, the wakes or funeral services have been replaced by what is called “Celebration of Life” ceremonies. People come to tell their personal stories about their experiences with the person who has gone. We are taking a longer view of things, focusing on a loved one’s entire life, not just on the ending. No sad organ music please. For the most part, Mexican people have always had this view. Their loved ones are expected to visit with them, to continue to be a part of their lives. Mariachi music is more appropriate. I have seen some very sad wakes in Mexico. For 24 hours, chairs are put in front of the home of the person who has passed away and people come and sit together for hours in silence. This is called the velorio. Then the long, mostly silent funeral procession takes the body to the grave site. There may be a lone musician playing the trumpet. But after the initial respect and sadness comes the joy of their loved ones’ return during the Day of the Dead celebrations. Marigolds are called the flower of the dead. They are everywhere during this celebration. The petals of the marigolds and the incense and candles help light a path for the dead back to their homes. I like to think that my mother and father still live through me. When I think that way, I feel I have more depth. I feel connected to the spiritual world. I am no longer alone. I am larger than just one person. I am also the carrier of the spirits of my family members who have come before me. I believe that the more I honor and remember my father and mother and their struggles to bring me into this world and into adulthood, the more I honor myself. I am part of them. I cannot disrespect them without disrespecting myself. 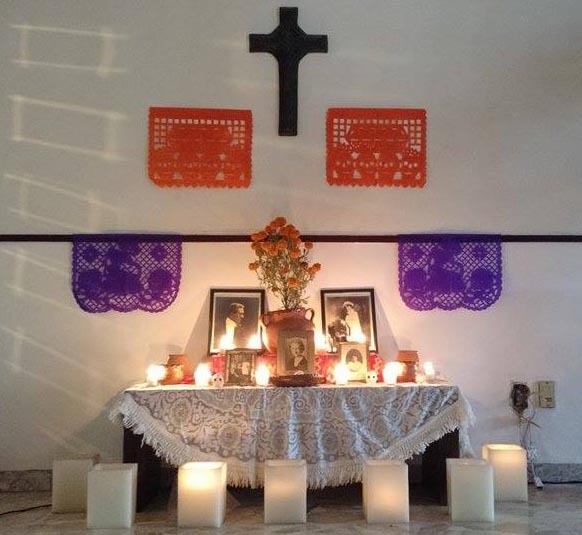 Maybe this belief in the spirits of loved one visiting Mexican families is part of what gives them depth of character. I have great admiration for the hard working Mexicans I encounter everyday here. I love their zest for living. Maybe death is to be celebrated rather than dreaded and mourned. If a person believes that death isn’t the ending but the beginning of another kind of existence--maybe there wouldn’t be as much fear and each day would not be thought as another day closer to the end. Instead it could be seen as another day closer to a brighter beginning. I certainly hope so.